The film portrays the life of Mahatma Gandhi, the lawyer who became the famed leader of the Indian revolts against the British through his philosophy of non-violent protest. The film won 8 Oscars, and recieved another 26 wins and 16 nominations. Sir Ben was awarded Oscar for Best Actor. A piece of Trivia : Sir Ben lost 20 pounds for the role of Mahatma Gandhi! Can you believe that even though I'ma big BK fan, this was one of his main films that I had never seen until recently? To add to it, I had to watch it in French. No problem really, because i'm fluent in the language, but t's always best to watch it in it's original format! Anyway, I thought it was very well acted. Very true to life. An Oscar winner, so to speak. 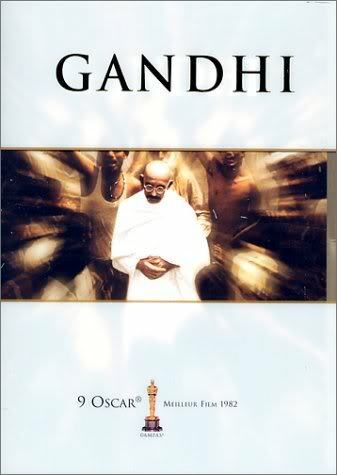 After being released on a 25th anniversary limited edition DVD in March 2007, "Gandhi" will soon be released on Blu-Ray disc. This re-release of the famous biopic is being highly supported by Sir Ben. The film will be presented in full HD 1080p quality, with the original 2:35 screen ratio and Dolby Digital 5.1 Sound. There will also be an interactive bonus part to the disc, including an interview with Sir Richard Attenborough, a director's commentary, and a story called "Picture in Graphics", detailing the life and legacy of Mhatma Gandhi. Sony Pictures is planning the release of this disc for 17th February 2009. You've got to have some talent to successfully portray someone so well. It's a good film. A masterpiece even.